A Post Medieval cast copper alloy Antwerp coin weight dating AD 1576. The weight is sub-square and features a shield, possible depicting the arms of Portugal, the reverse has the upright hand of Antwerp with K & I either side. The maker K I is unknown. Obverse: A shield, possible depicting the arms of Portugal. Reverse: Upright hand, between K and I, six pointed star below. Dimensions: length: 13.67mm; width: 12.50mm; weight: 1.45g. 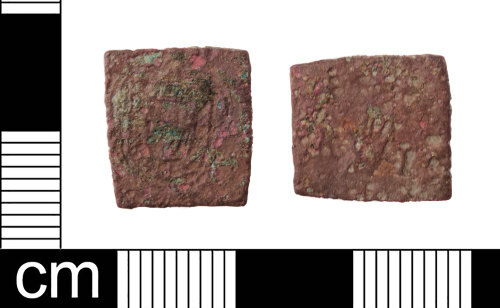 A similar coin weights on the database by maker K I is LON-278AD4.